Goree Foundation Announces Initial Scholarship Winners View article from The Chronicle News dated January 10, 2019 and the Correction printed in The Chronicle News dated January 15, 2019. Mary John Goree Las Animas County Scholarship Winners! View ad from The Chronicle News dated January 4, 2019. Mary John Goree Las Animas County Scholarship Class of 2018! View ad from The Chronicle News dated May 25, 2018. THS Seniors Named Scholarship Winners View article from The Chronicle News dated May 17, 2018. Mary John Goree Las Animas County Scholarship Winner! View ad from The Chronicle News dated January 5, 2018. Ruybalid Accepts Princeton Admission, Goree Scholarship. View article from The Chronicle News dated May 18, 2017. 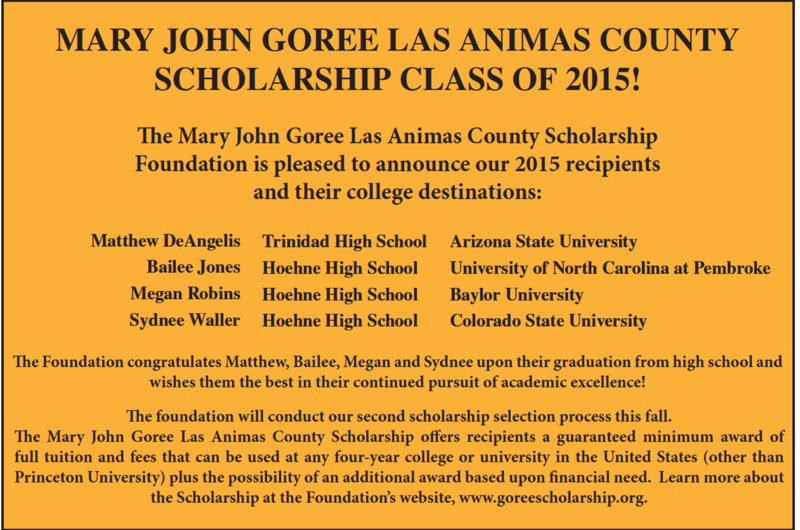 Mary John Goree Fund Announces Las Animas County Scholarships. View article from The Chronicle News dated May 18, 2017. Mary John Goree Las Animas County Scholarship Class of 2017! View ad from The Chronicle News dated May 12, 2017. Mary John Goree Las Animas County Scholarship Winners! View ad from The Chronicle News dated January 6, 2017. 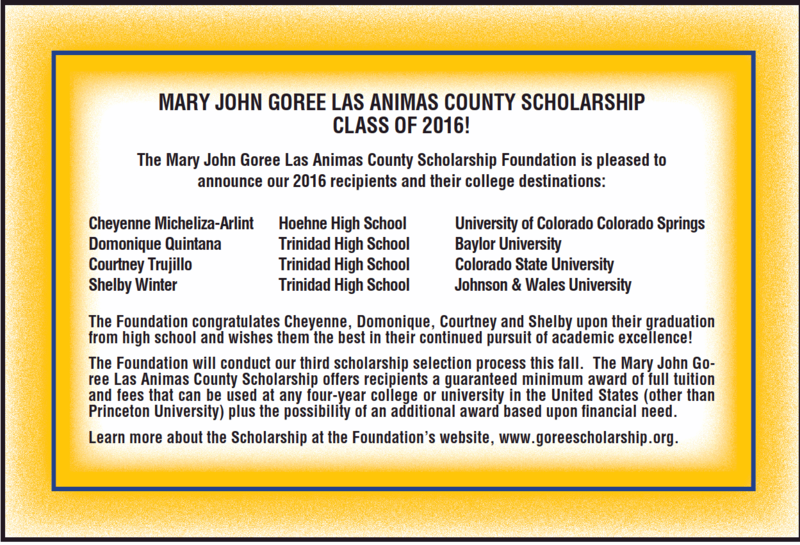 Mary John Goree Las Animas County Scholarship Class of 2016! View ad from The Chronicle News Dated May 20, 2016. Mary John Goree Las Animas County Scholarship Winners! View ad from The Chronicle News dated January 4, 2016. Foundation Announces Scholarship Class of 2015. View ad from The Chronicle News dated May 27, 2015. 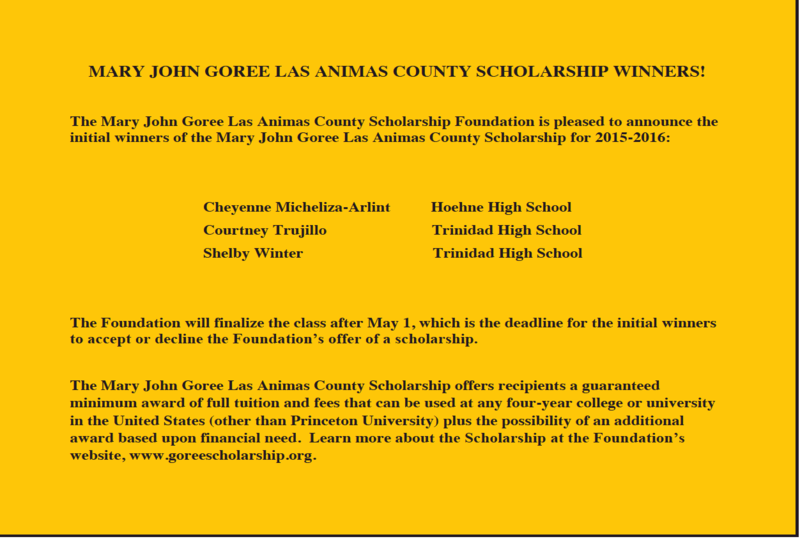 Goree, LA County Scholarship Foundation Announces Winners. View article from The Chronicle News dated March 5, 2015. Clarification on Scholarship Administration. View Letter to the Editor from The Chronicle News dated October 3, 2014. Public Meeting Set for Goree Scholarship Program. View article from The Chronicle News dated September 29, 2014. Search The Chronicle News Archives. David J. Vandermeulen, J.D., Ph.D.
See our press release for the initial winners for the Class of 2019. The final class members will be announced in May.